Pop Tarts made a rare appearance in our cupboard growing up, so when we had them in the house it felt like a special treat. My favorite flavors were strawberry and brown sugar. I always ate them toasted so the filling would be nice and warm – pure happiness (and sugar!) on a cold school morning. After a nutrition 101 class ruined the idea that Pop Tarts were an acceptable breakfast food, it has been years since I’ve enjoyed the nostalgic treat. 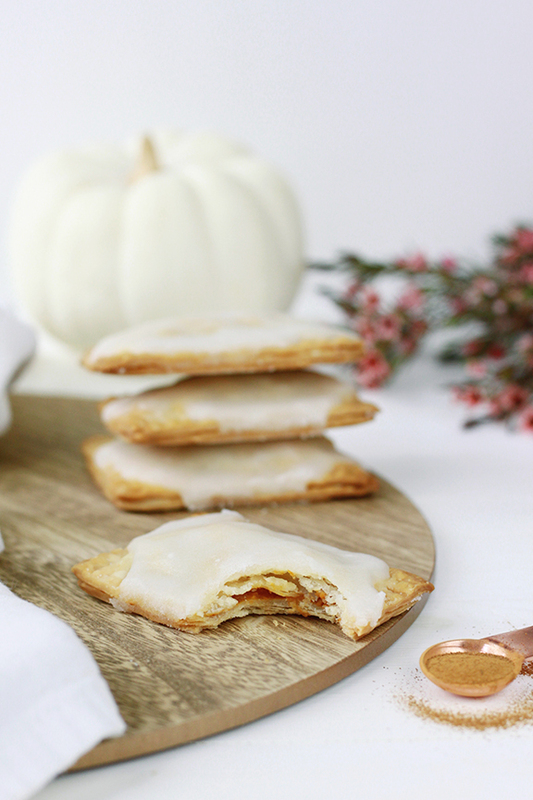 In an effort to walk down memory lane and celebrate the arrival of chilly mornings, I made a batch of homemade pumpkin pie pop tarts this week. 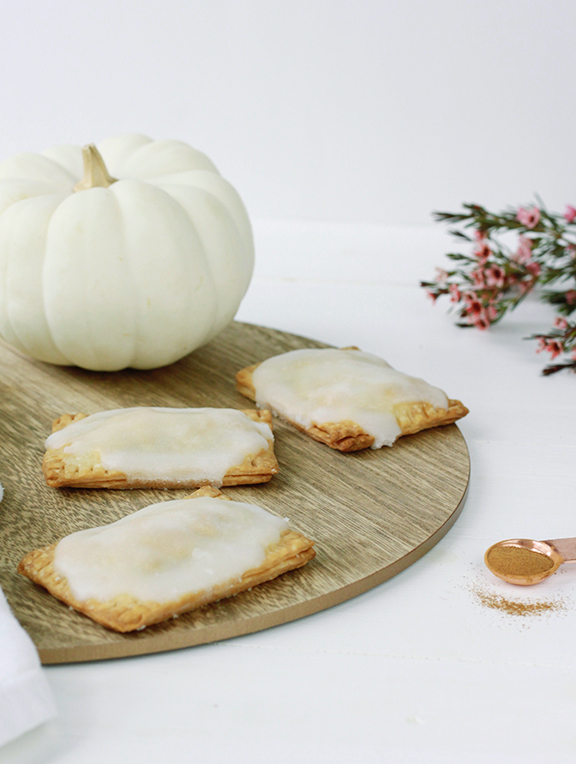 As these pop tarts baked in the oven, our kitchen started to smell like Thanksgiving morning. Pumpkin pie spice and nutmeg filled the air as I anxiously checked the timer, waiting to finally tuck into one of these fall treats! Once they were done baking, I whipped up a maple glaze to spread over the top of the pop tarts. 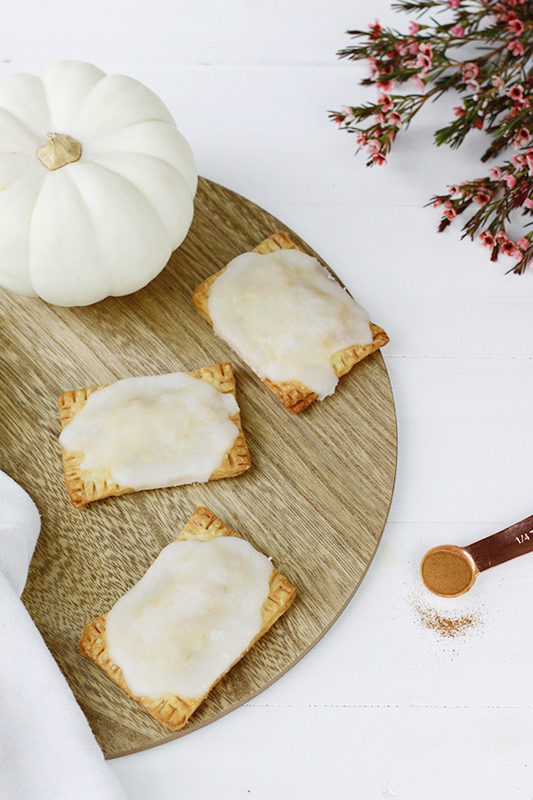 These pop tarts are a fun way to enjoy a grown-up version of a childhood treat and celebrate the arrival of autumn! Enjoy! In a mixing bowl, combine the pumpkin puree, maple syrup, and spices together. Set aside. Unroll the pie crust and cut out your desired size of rectangles. Make sure you cut an even amount so each pop tart has a base and a top. Lay half of your dough rectangle out on a baking sheet and spoon a dollop of the pumpkin pie filling into the center of the dough. Place another piece of dough on top of each pastry and crimp the edges shut with a fork. Bake for 25-30 minutes, or until the top of the pastry is golden. While the pop tarts are baking, mix up the maple glaze. When the pop tarts are baked and have been cooled, spread a thin layer of maple glaze on each pastry.